Regional differences: In the North of the country (Campine, sandy region of Flanders), the sandy lands dominate. In the South of Flanders, we meet argilo-sandy grounds, in Wallonie in the muddy region, there are big cultures (wheat, sugar beets). In the southeast, the shallow rocky height, the grounds and a more stressed relief are less favorable to the production. In this region, the agriculture concentrates essentially on the bovine breeding. Belgium is a small, highly developed and densely populated country (10 million of inhabitants) at the crossroads of Western Europe. Belgium is one of the founding members of the European Community, and its capital, Brussels, is also the capital of the European Union. It is a federal state, with 3 relatively autonomous regions: Flanders in the north, where the language is Dutch ("Flemish"), Wallonia in the south, where the language is French, and the centrally located Brussels, which is officially bilingual. Belgium's rich history has left impressive churches, town halls, castles and works of art, dating back to the early Middle Ages, spread around the cities and countryside. 57-51 before J.C: conquest of the Long pole Belgium by Julius Caesar. This region was lived by peoples of Celtic and Germanic origin. In the IIIth century ap J.C: invasion by Francs, Saxon and Frisian. The North is marked by the Germanic influence and the South assimilates the Latin culture. 843: Treated with Verdun, the Belgian territory is divided into two parts; Flanders is connected in France and east territories connected in Germany. Of the XIth in the XIVth: principalities form whereas cities become important centres of business and industry. XVth: the Belgian territories are the ownership of Dukes de Bourgogne. XVIth: the Belgian principalities are connected as a result of Netherlands then of Austria and Spain with Charles the Fifth. 1516-1560: Numerous revolts between the Protestants of the North and the Catholics of the South. 1579: Seven provinces of the North become independent and form Province united; those of the South replace under the Spanish authority. 1790: Proclamation of States Belgium united. 1795-1815: The Belgian provinces become French. 1804: By the Napoleon code, the Belgians become French citizens. 1815: Freed of Waterloo, Belgium pass under control of Netherlands. 1831: Independence of Belgium, proclamation of its neutrality and birth of the monarchy consitutionnelle: Léopold 1st of Saxe-Cobourg becomes the first sovereign. 1914-1918/1939-1945: this neutral state is occupied by the Germans during both world wars. 1947: Signature of the protocol of Customs union between Belgium, Netherlands and Luxemburg: Benelux. 1951: Adbication of Léopold III and succession of Baudoin Ier. 1957: Membership(support) to the EEC. 1977: The Pact of D'Egmont cuts relatively independent Belgium in three regions: Flanders, Wallonie and Brussels. 1993: Ratification of the Constitution transforming Belgium into a federal state. Belgium is a constitutional monarchy to representative system. The fundamental rules concerning the rights and the liberties, the organization of the State and the functioning of institutions, mainly the legislative, executive and judicial powers find their source in the Constitution adopted on February 7th, 1831. The procedure of modification of the Constitution is complex. During the first 150 years following the adoption of the Constitution, there were only three revisions (on 1892-1893, 1919-1921 and 1965-1968). On the other hand, since 1970, the demand of autonomy of two main cultural and linguistic constituents of Belgium, Flemish and the French speakers, gave place to several constitutional reforms. Belgium is a federal State today, as dedicates him(it) the first article of the Constitution; she(it) is organized around three communities (Flemish, French and German-speaking) and of three regions (Flemish, Walloon and of Brussels-capital), having of Brussels-capital), inclining a wide autonomy and a power to promulgate standards having force of law or a value equivalent to this one. This structure overlaps in the division of the territory in provinces and in the municipalities, the elected organs of which have a rather wide administrative autonomy. Further to the consecutive revisions, the Constitution was the object of a coordination and carries henceforth the date of February 17th, 1994. The federal Government assures the central direction of Belgium and consists of maximum fifteen Ministers. They form together the Cabinet steered by the Prime Minister. The Ministers and the Prime Minister are named by King and live generally in function during four years. They have to answer of their decisions in front of the Parliament, which consists of a Chamber and a Senate. and the triangulation of the communes. With the Napoleonic conquests, the Belgian areas became a part of France and a French cadastre was created for the Belgian areas. Napoleon said "A good cadastre of the parcels will be the complement of my civil code". 1976: the magnetic cadastral file and the computer updating. 1987-1989: Creation of a national computer file of the artificial persons of public law -owners- and artificial persons of private law-owners-, constituting a cadastral database of the owners. 1990: Creation of national file of the individual owners with a database. It was the last step for the national file of the owners knowed by the cadastre. 1994-1995: Online updating in the decentralized services, (contrôles) with the "Cadastre Network" of the cadastral file (owners and parcels of land). The agency that is responsible for land registration and for cadastral surveying is the Patrimony Documentation Department (before the "Coperfin Reform" > Cadastre, Registration and Public Property Administration) and this on a National Level. The Patrimony Documentation Department collaborates with the local government (the districts, the towns) and the IGN (National Geographic Agency). Partner with the Notaries: The administration is also orientated towards collaboration with the Notaries. The Notary is the writer of the deed and it is logic that he makes also the analysis of the deed. So the updating of the juridical documentation respects the common intention of the parties. This reform has a cost and the Notaries have new responsibilities. This reform is in the moment examined bilaterally with the professional unions concerned, especially the computerized framework where the analysis of the act will be made. Partner with the Surveyors: By now, a great number of private surveyors collaborate with the cadastre and this is under the way of an agreement that they should signed to give the swap of information. The surveyor has access to the necessary information for the identification of the parcels that must be surveyed. In exchange for this information, he transmits to the cadastre all the information and a standardized map and this in the context of the plan CADMAP (digitizing of the cadastral map of parcels). The second phase of this process of collaboration is a law taking in compliance of the Mortgage law that will impose the preliminary cadastration before the act transferring the immovable property and also a map when new boundaries are created. The third phase will be a law that will impose for each act transferring the immovable property, a "boundary markings plan" made by a surveyor. This "boundary markings plan" will identify the cadastral parcels. The professional associations for the surveyors (private and public) are UBG and ANGE. The number of members of UBG is 600 (included 50 cadastral surveyors). The number of members of ANGE is 500 (included 350 cadastral surveyors). ** In accordance with the agreement of Bologne BAC + 5 years + a compulsory training period of 2 years (see http://www.geometer-europas). Historically, Belgium has a Napoleonic Cadastre. The Belgian cadastre should have been in the beginning a legal and juridical cadastre system where the immovables files should be update by civil servants. These immovables files should be the proof of the property. The civil servants should have an active updating. But it wasn't so because it was not possible to consult all the needed titles. The Belgian cadastre is a "personal cadastre". When we say that the Belgian cadastre is not a juridical cadastre, it doesn't mean the Belgian cadastre has not any juridical quality. Indeed, the Belgian cadastre doesn't give a title, but without title, the Belgian cadastre can give a presumption. The title proof only comes from the notarial deed. The proof for the third party is possible only if the notarial deed is transcribed in the mortgage service. However, in Belgium with the fiscal assignment of the cadastre, the cadastral documentation has a juridical value because the cadastral files are titles. Some administrative legislations give titles to the cadastral documentation, for example compulsory purchases, regrouping of lands, national and regional developments. The Belgian system consists of to assure the publicity of the immovables, in fact the ownership during thirty years (titles). The publicity is made by the Registration and the Mortgage Service. Practically, the reliability of the cadastral data is very high. In Belgium there is only one cadastral system covering the complete territory. But the national cadastral files are used by "The Agency of the Inventory of the Property of the State", Wateringues, Polders, Natura 2000. 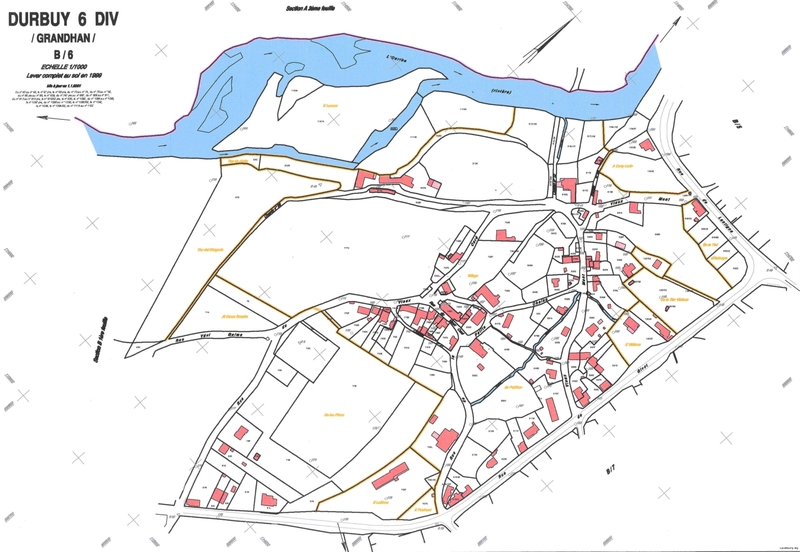 The main unit in the cadastral system of Belgium is the cadastral parcel (national level). The files of the owners, the files of the parcels and the cadastral register are relation to one another. Refer to "Cadastral Concept" and Topic D.
The polyester film were vectorised in 2000 and 2001; they are currently corrected, completed and updated so that in the near future, the territory of Belgium will be completely covered by a digital plan. In 2004, CADMAP will be the application that will manage the cadastral digital plan. FPS Finances customize the software "ArcView" to allow recapture, management and updating of the cadastral plan. Parcel monuments, municipality monuments, miscellaneous monuments. 3) The boundary marking within the context of the preliminary cadastration (search for the boundaries of the parcel). The current initiatives for the late sharing of the inheritances is a better collaboration with the Notaries. For the problems of the boundaries, it will be a law taking in compliance of the Mortgage law that will impose the preliminary cadastration before the act transferring the immovable property and also a map when new boundaries are created. The setting-up of the PCC (The Permanent Committee on Cadastre).